A lone car sits in the ditch of Hardin-Wapakoneta Road near its intersection with Greenville Road just south of Hardin. Upon arrival, Shelby County Sheriff’s Deputies found the vehicle, owned by Heather Lee Hendrickson, of 3856 Hardin-Wapakoneta Road, with front end damage and a smashed windshield. The driver, Hendrickson, had left the scene. The Lockington Fire Department and Houston Rescue also responded. 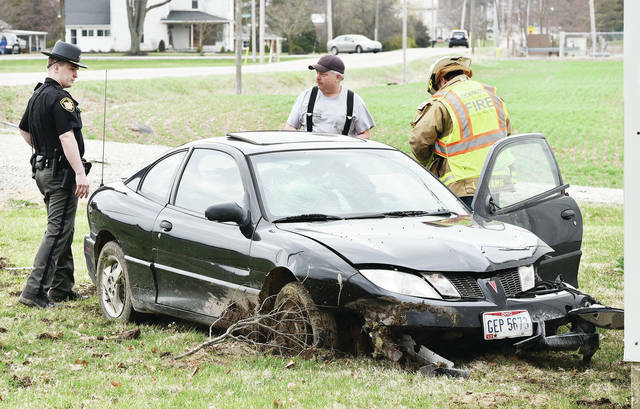 The accident occurred around 6:10 p.m., Sunday, April 7.